Laporte, G. 2013. Development Finance in the Post-2015 Context. (ECDPM Presentation). 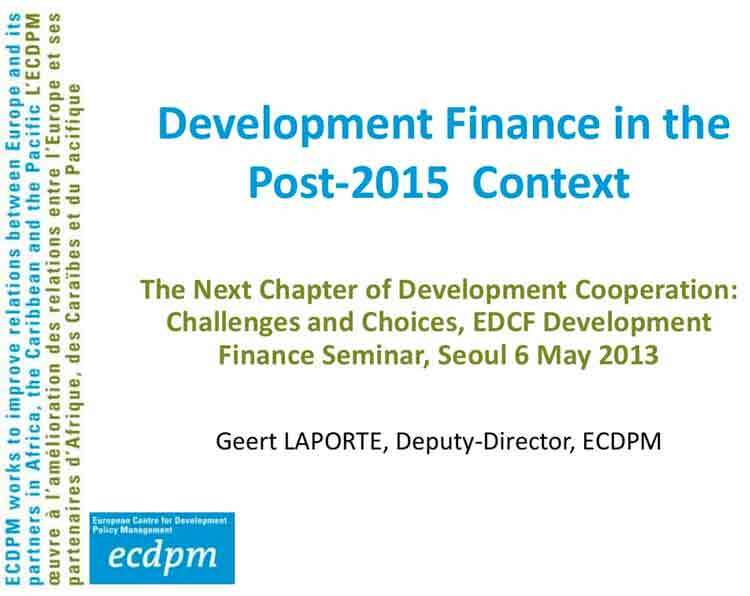 Presentation made by Geert Laporte on 6 May 2013 in Seoul during EDCF Development Finance Seminar. 1. Development finance in the post 2015 context. 3. What has been achieved with MDGs? 5. How to finance development Post 2015? 5. WHY A EUROPEAN REPORT ON DEVELOPMENT? 1. Major global challenges: climate change, food security,management of natural resources, fragility and conflict,terrorism, migration etc. 7. WHAT HAS BEEN ACHIEVED WITH MDGs? OVERALL: need for a more political and economic governance vision of development Post 2015 + bolder global collective action! 9. HOW TO FINANCE AMBITIOUS DEVELOPMENTAGENDA POST 2015? • Increasing focus in the development debate on policy coherence for development (“development friendliness” of non-aid policies), South-South cooperation, on the developing country’s policies (domestic resource mobilisation, taxation,…) and less on the quality and effectiveness of aid. 10. MOBILISING DEVELOPMENT FINANCE: WHAT ISKEY FOR DEVELOPING COUNTRIES? • Volume: how high is the level of resources that can be raised?• Predictability: how sensitive are the financial flows to fluctuations? • Policy space: how much room for manoeuvre does the financial flow give? • Development focus: to what extent do the different financial flows contribute to development? • Does ODA reduce the incentives for governments to raise taxes? 18.IS THERE STILL A ROLE FOR AID (ODA)? 1. Ambitious Post 2015 agenda requires global action and major increases in development finance.